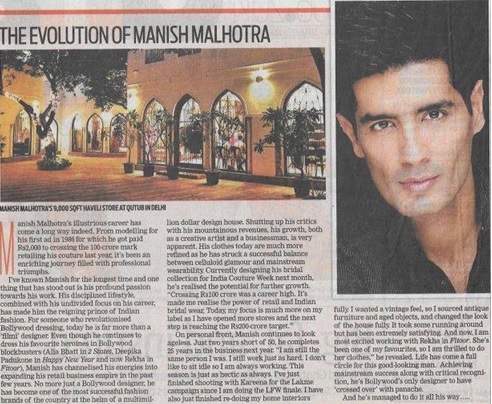 In a world that is full of talent and new trends, a name – Manish Malhotra stands out. Even in this world of competitive fashion designers, this self taught fashion guru holds the number one spot. Manish looks like a star himself – had he not been a designer he would have definitely been a Bollywood actor. His love of fashion and glamour brought him away from the world of modeling into the world of creating couture. He has not only made a place in the heart of Bollywood stars but also in the heart of Indians who love what he brings to the fashion world. Here, we take a look at his journey. 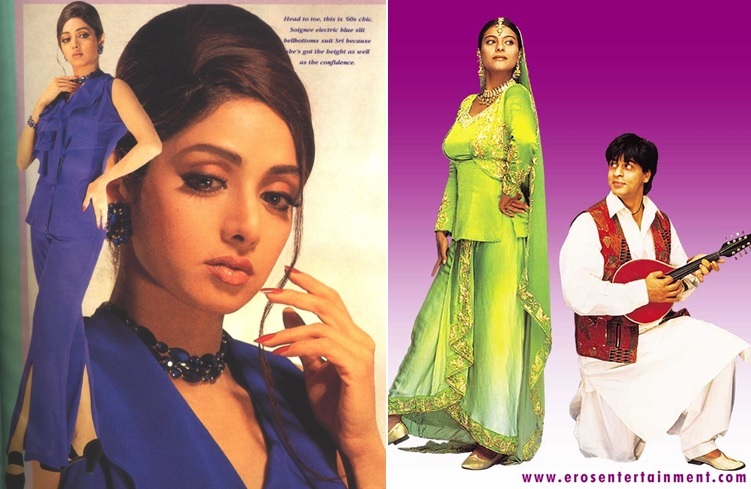 What was Bollywood fashion before Manish Malhotra? As we reflect on Bollywood fashion and fashionistas over the years, we are struck with a sense of wonder. Did you know that actors in the 1930’s, 1940’s and 1950’s (like Waheeda Rehman, Sharmila Tagore) chose their own costumes? For period costumes the trendsetter, beginning in the 1950’s was fashion designer Bhanu Athiya who worked on period film costumes such as Sahib Biwi Aur Ghulam and Amrapali. She also inspired national trends which she created in movies like Teesri Manzil, Chalte Chalte, Karz and Chandini. Awarded the Academy Award for Best Costume Design for Gandhi in 1983, Bhanu Athiya was ­the fashion designer who influenced not only Bollywood, but also fashion trends that the rest of India followed. If there is any other fashion designer in the world of Bollywood, doing the same as Bhanu Athiya now, it will be Manish Malhotra. True, there are other designers like Sabyasachi Mukherjee, Neeta Lulla, Suriley Goel, Vikram Phadnis, Tarun Tahiliani, Rocky S who have made their mark in the Indian fashion world. 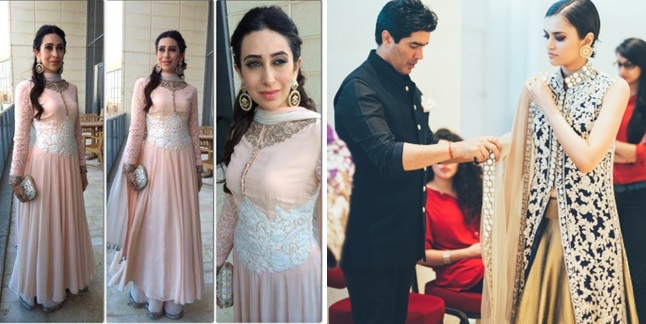 But there is none other than Manish Malhotra who has been able to attain the fine balance of clothes designs which are comfortable, fashionable and trendy and for all – not just for the stars. This is what makes him so popular and so loved. So who is Manish Malhotra? What has been his story so far? We cannot say that we have seen all of what Manish is capable of achieving. We think that this post will need to be updated every year to showcase the talent that he has. Manish, not only ups his game every year, but he thinks out of the box every season, of every year. The genius has turned into a legend and so far his work proves it. Manish considers his mother his inspiration. He credits her for being able to follow his dreams and becoming a fashion designer. Coming from a business class family, he was expected to join the trade. Manish decided to follow his dreams, his passion. He started off with some modeling assignments while still in college. Manish also joined a fashion boutique learning and honing his interest and skills. His belief in himself was very strong and he learnt the ins and out of the trade and the end to end of creating dresses for women during his work there. Even though he started out with understanding fashion for women, he has also been creating couture for gentlemen as well. Without the backing of an art school name or a design school diploma, Manish truly honed his eye for fashion in the real world – while working and practicing his art tirelessly. Stepping into Bollywood at only 25 years, he created for the first time; couture looks for Juhi Chawla in the movie Swarg (1990). In 1993, he also designed costumes for Sridevi in Gumrah. He started off with dressing up two of the top most heroines of the time, but his journey had only begun. Just two years down the line, he designed costumes for Urmila Matondkar in Rangeela. At the age of 28 he became the recipient of the Filmfare Award for Costume Design for Rangeela. As Manish is a very private person, we do not know how he really got his first break. As it should be – all we know that his talent got him noticed and moving ahead in the industry. There was no looking back after this. His work in blockbusters and critically acclaimed movies like Dilwale Dulhania Le Jayenge, Dil Toh Pagal Hai, Satya, Kuch Kuch Hota Hai, Kaho Na Pyar Hai, Mohabbatein, Dhadkan, Asoka, Kabhi Khushi Kabhi Gam, Kal Ho Na Ho, Sivaji: The Boss (Tamil), Om Shanti Om, Dostana, I Hate Love Storys, Enthiran (Tamil), Bodyguard, Rockstar, Student of The Year, Yeh Jawani Hai Deewani, Jab Tak Hai Jaan, Chennai Express and 2 States created ripples in Indian fashion. Bollywood leading ladies began to claim that no one could dress them better than Manish Malhotra. They swore by his fashion sense to make them look like stars and fashionistas. As Manish’s adulation in the film fraternity grew, so did the Indian hip junta’s obsession with his clothes. There were rip off’s of the lehengas and saris in Chandini Chowk (which truly is a sign that fashion has reached the streets of Delhi). Mumbai street fashion acquired a sudden finesse and style. Indian women could relate to the fashion that Manish created for Bollywood beauties. The Indian skin tone was truly appreciated and glamorized by Manish. We have seen how he has dressed dusky beauties like Shilpa Shetty, Deepika Padukone and Kajol in bright colors making them look classy and stylish. He was also able to take into account not just the ongoing fashion trend but also the physical bearings of his stars to make them look really beautiful. In turn, that created new fashion trends. In the 90’s all movie heroines wore the same kind of outfits (except for Divya Bharti, we must say) without realizing what they could carry off and what they couldn’t. Manish showed how stars should be dressed on and off camera. His clients are the same Bollywood fashionistas that he dolled up in movies. It is hard to let go of his style and the elegance his clothes impart once you know how his clothes sit on you. Starting his label was a natural decision. 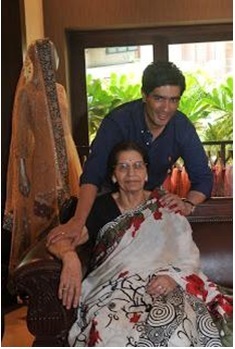 At the age of 39, in 2005, he launched his label: MANISH MALHOTRA. 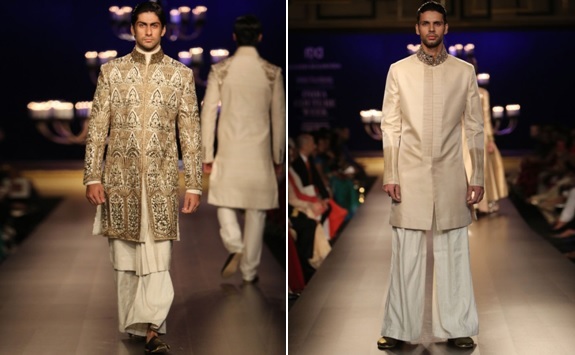 He also began working with artisans of Mijwan and Kashmir to incorporate a different look to his body of work. Manish is not only a household name now, but the label has gone international. He has styled international celebrities like Kate Moss, Naomi Campbell, Late Micheal Jackson and Kylie Minogue. His stores are based out of Mumbai and Delhi currently. Manish’s label has also reached London, New York, Canada, Riyadh and Dubai. All those dying to see his current collection will be happy to know that he has a website too. Pick up your favorite outfit and feel like a princess or a prince! 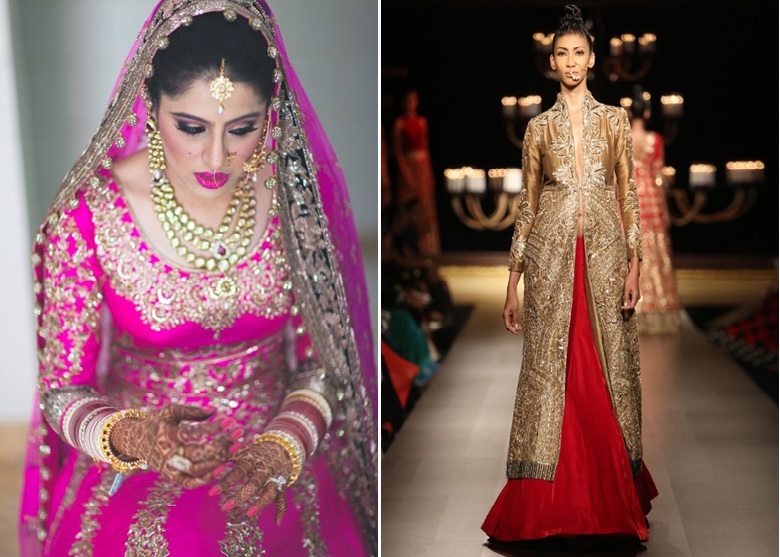 Manish has yet another talent – not so hidden anymore – bridal lehengas. He has been able to capture the imagination of Indian brides all over the world. How he incorporates a soldier’s uniform buttons at the back of the blouse of a lehnga – yet making it look so feminine and chic – is really noteworthy. The work on lehngas is never boring – you may find subdued zari of which you can just see the shimmer in the light, or bold and heavy zari which done to get the world’s attention. Manish has been able to create a balance, has been able to give different brides what they really would love to wear on their wedding day. Reviving old traditional wear such as shararas, anarkalis, kalidars, zari saaris, sharara kurtas, jackets etc will leave you wide eyed like a baby. Every woman would feel like putting these on – despite them being so traditional – as he has made them look chic – he has branded them as MANISH MALHOTRA chic! He has brought back and married fabrics like malmal, net and chikankari, georgette patch saaris and more to tease the senses into the luxury and glamour of his clothes. Last year Manish took the opportunity to celebrate 100 years of Indian cinema by creating an exclusive collection for a runway event in Bangalore. Also, why should men feel left out from his fabulous sense of style? Men look glamorous and stylish in ethnic Punjabi and pathan kurtas, jackets, band galas, sherwanis, pleated kurtas, jackets with quilted yokes, kurtas with mirror work collars, raw silk chikankari bandi, chikankari jaal sherwani, with flared pajamas. You need to see to believe how the old school traditional work is being revived and being made to look glamorous. For all those who love period classics like Umrao Jaan love these clothes instantaneously. For those who have not really explored period clothes, these are exotic and all the more attractive. 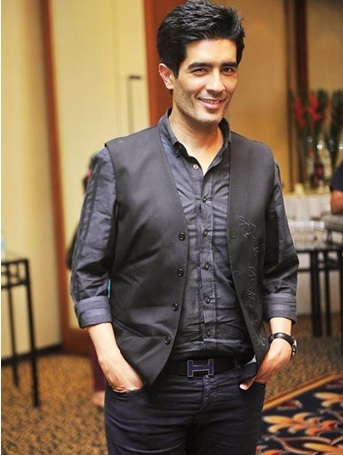 As we had stated earlier, we will need to keep updating this post for the best of Manish Malhotra. He has not stopped living, breathing, dreaming fashion in the past few years. There is a sense of newness with his clothes and sense of familiarity and style that all feel riveted to. We wish Manish many long and happy years in this industry. We hope that his clothes inspire a generation which loves being the traditional Indian as well as the Modern Indian. With Manish’s clothes one feels that he has not forgotten his roots. He also knows the reality of the times he’s living in and has been able to maintain a sense of balance. Give him a brief of a glamour queen who loves her western outfits and he will deliver that for you, give him the quintessential Indian beti brief and he will stun you. His clothes speak for the talent he wears on his sleeve. 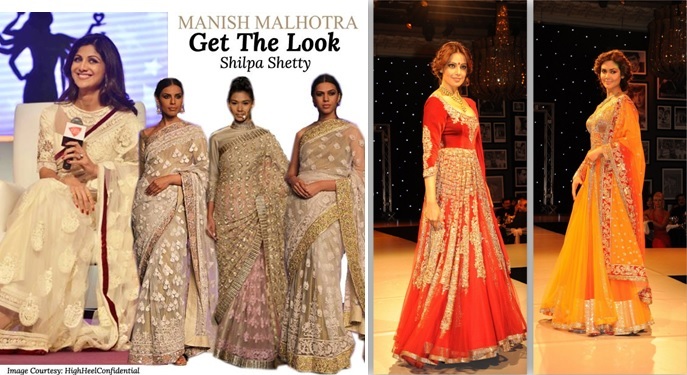 Enjoy some of Manish Malhotra’s best work below. Don’t forget to click on each image to view them larger!